Neon purple; it was bird droppings and the color was intense against the bright new wood of our deck. It wasn’t just one dropping; there were lines of droppings underneath the rails and every place that this bird had perched. What bird did this, and what berry could be soooo purple? The answer came an hour later when I heard a rustling sound by the deck. 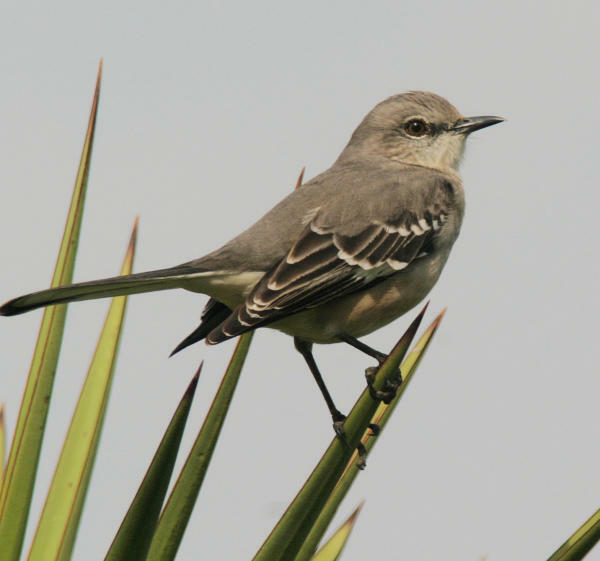 A Northern Mockingbird was fluttering up against the glass. It wasn’t a violent attack; instead, it was more of a courtship with its reflection. After a few seconds of fluttering, the mocker would settle onto the back of a chair, relieve itself, preen for a few seconds, then fly to a cluster of yew trees yielding large purple berries. Natural food sources are important in any backyard sanctuary. Fall is a good time to plant shrubs, vines and trees that will produce fruits and seeds next year to attract birds. As summer heat diminishes, newly installed plants won’t be stressed to survive extreme temperatures. In many regions, fall and winter bring more frequent rains, increasing the survival of new plantings. Berries in particular are a source of carbohydrates that birds seek prior to and during migration. It’s time to plant berry-producing plants now to increase the abundance and diversity of birds in your yard in the future. The most beautiful and effective plantings start with paper and pencil. Doing a little planning with regard to what to plant where is an efficient way to fill every nook and cranny of available space with plants that attract birds. Many organizations, including the National Wildlife Federation, offer colorful schematics with sample planting plans. Many plant nurseries offer advice on landscaping plans, although sometimes at a modest cost. You can get hints just by talking with the staff at nurseries and carefully describing your objectives (lots of birds!). When bird food is your goal, plants break down into four main categories: Those that provide seeds, fruits, nectar sources, and flowers and leaves that attract insects that in turn become snacks for birds. When the plant foods appear is essential. You’ll want plants that provide these food sources over as many months as possible. If all your plantings climax at the same time, you might miss birds that pass through at other times. The ideal sanctuary has something to offer from early spring through late fall and even into the winter, when natural food sources become scarce. Another consideration is the “vegetative complexity” of your sanctuary. The more layers of vegetation you have, the more food sources you can provide. For example, you could plant tall trees, vines that grow on the trunks of those trees, tall and short shrubs, and grasses and flowers low to the ground. Native plants often require less water and care after they are established. Non-native species are fine as long as they are not invasive. That is, if they are unlikely to escape from your yard and take over the neighborhood, destroying native vegetation along the way. Sadly, many plant nurseries still offer species that are highly invasive, so be sure to do a little homework before you start planting. Don’t underestimate the value of what’s already in your yard. If you have tall trees, start by adding some vines that will grow quickly up the trunks. In my area, Virginia creeper produces clusters of fall berries that are the only reason I have Wood Thrushes, Gray-cheeked and Swainson’s Thrushes in our yard. Our naturally occurring poison ivy vines capture piles of fall leaves, providing shelter for spiders and other bugs, which attract Carolina Chickadees and Tufted Titmice, plus Golden-crowned and Ruby-crowned Kinglets all winter long. Trumpet vine is great for Ruby-throated Hummingbirds and other nectar-feeders. Although many gardeners seek to space plants to provide plenty of sun and room to grow, consider some areas of thick brush that provide habitat for declining species such as Eastern Towhees, Brown Thrashers and native sparrow species. Build on the benefits of these areas by surrounding them with fruit- and nut-producing shrubs. Beautyberry, red osier dogwood and viburnums produce good fruit crops that will lure skulkers such as Gray Catbirds and White-eyed Vireos into the open. One especially cold winter I had an Eastern Phoebe patronize my beautyberry. Cone flowers and sunflowers produce seed heads that goldfinches crave. Taking advantage of the well-established plants that you already have is a good strategy to maximize the bird benefits of your plantings. Watch what wild birds eat and then bring those plants into your yard. Grab a leaf or fruit from whatever you see wild birds eating, identify it and see if your local nursery has it or a relative, or look online. When I saw American Robins feeding on white mulberry, I knew I had to have one in our yard. One of our local banks is landscaped with weeping holly that draws flocks of Cedar Waxwings – now I have three in our yard. A good thundershower saved me; it washed off the purple on the porch. I was reminded that, had I sealed the deck a little sooner, none of this would have been an issue. But who has time to seal a deck when there are so many great birds to study in our yard?